Takenaga’s work is psychedelically abstract, densely filled with marks that culminate in an overall energetic flow. These vibrant marks, often circular in individual form and wavering in overall view, pop off their black background creating an essence of oscillation. Departing from or building toward the whole, her marks are seemingly caught in a freeze-frame of their own life/death cycle. 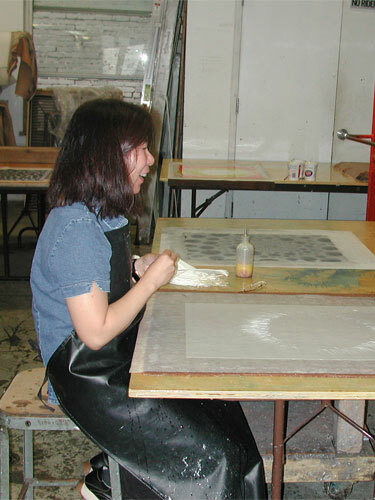 In working with Artistic Director Paul Wong during her residency, Takenaga translated her imagery within the paper instead of on the paper substrate. Working very systematically, Barbara carefully placed circles of intensely pigmented linen pulp paint on top of a base sheet of black cotton. 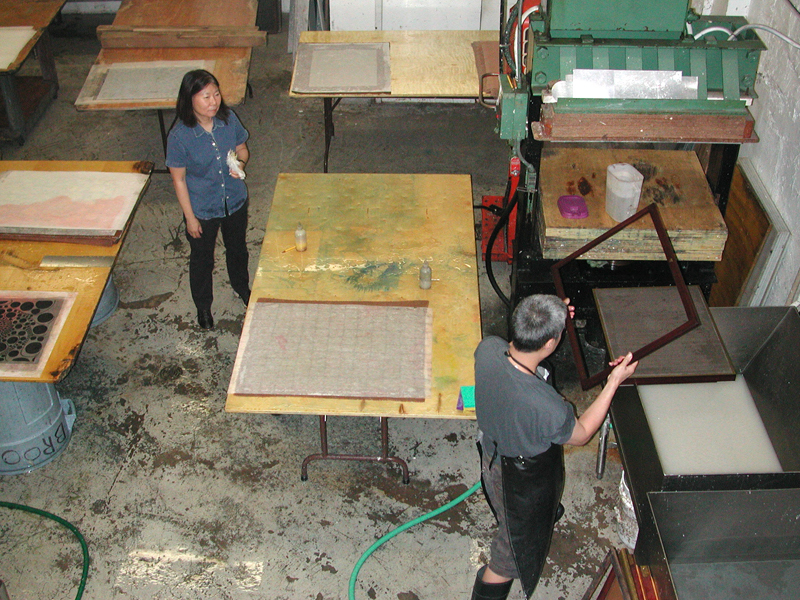 Working with similar imagery to her paintings, the outcome varied slightly through the material of paper pulp itself. Allowing the pieces to be ever-so -slightly less controlled through the process of pulp painting itself, an overall sense of vibration evolved. Barbara also produced a number of watermarked pieces in continuance with her spiral imagery. This series of work was created with a single watermark, hand drawn by Takenaga with puffy paint on no-see-um mosquito netting. They were formed by placing the netting on top of the papermaking mold and then pulling a sheet of translucent abaca over the raised watermark. 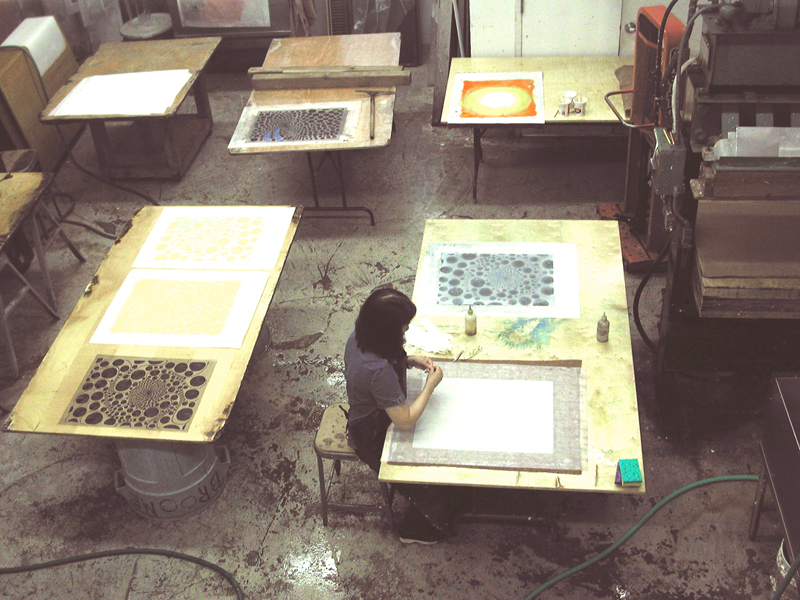 These delicate pieces are shown both separately from and in overlap with her pulp paintings. 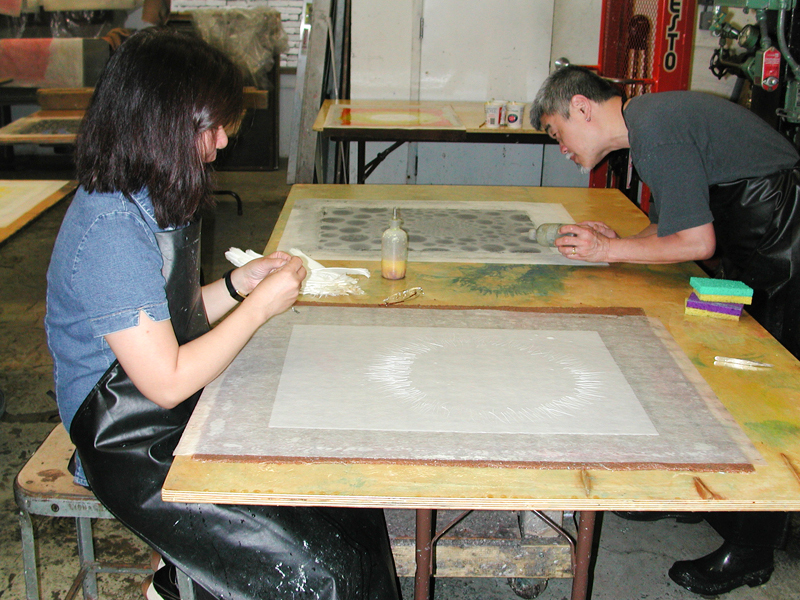 Takenaga also produced a series of translucent works in which she embedded individual pieces of feathers between two sheets of abaca. The result is an ephemeral flowing radial image, as if something perfectly delicate and fragile was caught bursting from its core. Barbara Takenaga received her BFA and MFA from the University of Colorado at Boulder and is a Professor of Art at Williams College in Massachusetts. She is represented by DC Moore Gallery in New York City (link below to her most recent show).